Some of you picked up on the line in my meeting with angels post regarding Adoration. I shall pass on what the Sister Angel said to me and showed me. Firstly, she said to remember that Adoration is like being in an X-Ray machine. God will show one all one's sins and tendencies towards sin. But, one must also remember that one builds up to "radiation", and does not over-do Adoration. She warned me against going for more than a few hours a day, for example, and to ease into being in the Presence of God. The Tyburn nuns usually do not do more than two complete hours per day, although the Divine Office is said in the Presence of the Eucharistic Heart of Jesus. And hour a day to start with and even broken up into two half hours at a time form a good beginning. Secondly, we must remember that we have bodies and that we are not pure spirits. Therefore, if we are becoming closer to God in prayer and in Adoration, we must not tire ourselves out, but be aware of human limitations. Most of the time I was in Adoration, Sister Angel was as well. She went more than I did. She obviously had more stamina for Adoration than I did. She said that deep intense prayer needed guidance and she was giving that. Thirdly, one must remember that silence is best, not reading anything, not singing, nor the rosary, but complete silence. She showed me this by example, and this was confirmed by what another person said to me about the same time. If one needs to say the Divine Office in front of the Blessed Sacrament, fine, but it is better to come to Christ without any distractions. Sister Angel just sat in front of the Blessed Sacrament or knelt. Of course, she said the Divine Office when the nuns did. But, to learn to contemplate Christ is best. He wants to work healing and repentance in us. He wants to speak to us, and this cannot happen when we are reading prayers. She did remind me to do Lectio Divina, which is a hour of meditation on a Scripture passage a day, and which I did as part of the Benedictine Rule. It is interesting that the week I met her, I was reading and meditating on Tobit. Remember, at that monastery, there was twelve hours of Adoration a day available. She was in the chapel most of the day. Fourthly, we take back out into the world what we become in adoring Christ. She was keen on this aspect of prayer and meditation-to go out and serve those in the world. I think of another great servant of God. Mother Theresa had a famous saying on Adoration-"I look at Christ and He looks at me." One must be prepared for the shock of seeing one's sins and imperfections and be grateful for that knowledge. I am glad that Sister Angel reminded me of my physical as well as mental limitations. Being present to Pure Love is purifying and one must cooperate with the purification of the senses and spirit. BTW, I mentioned that I never saw her eat. In fact, she would give me some of her food daily, which was very sweet, as her food, as a guest, was better than mine, as being closer to what the nuns ate. She thought I needed it. For new readers, use the tags or labels at the side and follow the purification series, by putting perfection, perfection again, and coctors of the Church in the search bar; or use the labels and click. There are over 400 posts on this subject. Later, I shall answer the questions of several commentators. But, I just got back from the Prayer Vigil for Atonement for the passing of the abortion law here in Ireland. About 150 of us, including three priests, Fr. Michael Ross being one of Priests for Life, people from HLI, and John Pridmore prayed the chaplet and the rosary. Only a few people passing by said nasty things, otherwise it was quiet, but very hot. This was outside the Dail. Tomorrow, there is another atonement prayer service at Knock at 7:30 pm in the Blessed Sacrament Chapel. Maybe some of you can make it. One of my readers asked me why God did these two things: one, cause the Hebrews to wander in the Sinai wilderness for forty years. She thought that the adoration of the golden calf was dealt with at the foot of the mountain. Yes, God did punish many of those who built the golden calf by death immediately when Moses came down from the mountain. However, the problem of the interior lives of the Hebrews required that there souls be purified. Of what? As I heard in a sermon long ago, the bodies of the Hebrews were freed from slavery in the Exodus, but their souls had to be freed from the slavery of sin and idolatry in the Wandering. The hardest thing for some of the Israelites was that they had to adore the Unseen God. Although God spoke to Moses, His Voice was not heard by all. There was too much sin and corruption in the souls of the Hebrews blocking the Voice of God. One can see that 40 years is a generation. All of those who came out of Egypt, barring a few, like Joshua and Caleb, were not allowed entrance into Canaan, not merely because of punishment for idolatry, but because they simply were not strong enough to conquer evil. One cannot conquer evil outwardly if one has not conquered it inwardly. This is what purification is all about. As in the purification series here on this blog, the process of allowing God to get rid of all sin, the proclivity to sin and to be filled with the Holy Spirit is necessary not only for personal holiness, but for making the Church and the society holy. Without personal holiness, the Church is weak. God had to purify His People. They were purified to the point where their children were being formed in God's ways from little on. This is what we need to do now. Form our children from little on to be pure so that they can overcome evil. 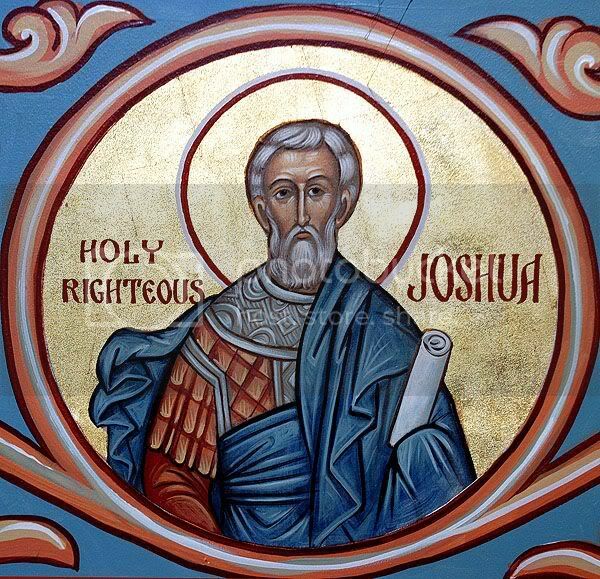 Evil will thrive and grow without the purity of St. Joshua. Secondly, the Canaanites were bad news. I have studied their culture.They sacrificed babies, usually the first-born, to Moloch, and archaeologists have found clay jars with the skeletons of infants in them. They would roll these jars into the mouth of the furnaces of Moloch. They also put the bodies of sacrificed children under the foundations of houses. By the way, an old missionary priest friend of mine told me the Maoris did the same thing with the bodies of their slain enemies. His church was built over a Maori home and the remains were found under every one of the main four posts. The idea that the dead gave strength to a house and protected it is not confined to the Canaanites. Joshua's name is the same as that of Jesus. The name means Saviour. 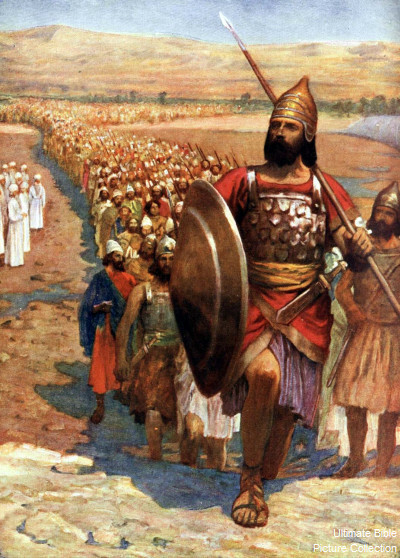 and Joshua, like many other leaders in the Old Testament, is a type of Christ. He tell us something about Christ and points to Christ's winning the battle over evil and death. He is a type of Christ for leading the Israelites into the Promised Land, as Christ leads us to Heaven. But, not without spiritual warfare. And Joshua had to fight against cannibals. I recommend reading the Book of Joshua. But, the Book of Wisdom also refers to these bloody rituals. The woman who asked the question could not understand offensive warfare dictated by God in the Old Testament. For a context, many in 2013 have lost the idea of defense; that is, that in Catholic teaching, one may defend one's family, one's nation, and even one's property. 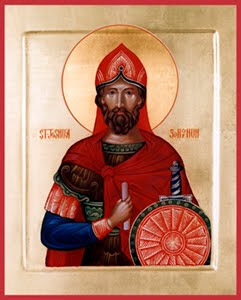 However, the offensive wars of the Old Testament, like the destruction of the five cities by God, two of which were Sodom and Gomorrah, are hard for modern Catholics to understand. God called His People to a holiness and He called them to the Promised Land. His Will was to cleanse those lands of evil so that His People would thrive in holiness. Christ does not call us to offensive war, except in prayer. Spiritual warfare needs spiritual weapons. However, we have a right to defend ourselves and a duty to defend those who are weak-children, women, the elderly. As in The Mission, there are two ways to withstand evil. One is fighting, and one is witnessing peace. Both groups were right, but all but a few died. Make pursuing the path to purification a priority in your lives. Teach your children and form them from the cradle. They shall see the age of the Canaanites. It is already upon us in some places. I think that many Catholics forget the list of woes stated by Christ. Two points can be made. One, Christ was addressing those who were the leaders of His People; and two, there are consequences for living a life of hypocrisy. How can a Catholic avoid being a hypocrite? By thinking like a Catholic and being obedient in all things, great and small, to the Catholic Church. I told my seminarian students years ago that the Catholic Church had become too respectable, too middle-class, too accommodating the the culture. Thankfully, God is changing the culture so that we all shall have to make hard choices. We shall be forced to choose Christ or comfort. That simple. Some Catholics ignore the harsh words of Christ and only want the lollipop words. 13 But woe to you scribes and Pharisees, hypocrites; because you shut the kingdom of heaven against men, for you yourselves do not enter in; and those that are going in, you suffer not to enter. 14 Woe to you scribes and Pharisees, hypocrites: because you devour the houses of widows, praying long prayers. For this you shall receive the greater judgment. 16 Woe to you blind guides, that say, Whosoever shall swear by the temple, it is nothing; but he that shall swear by the gold of the temple, is a debtor. 17 Ye foolish and blind; for whether is greater, the gold, or the temple that sanctifieth the gold? 18 And whosoever shall swear by the altar, it is nothing; but whosoever shall swear by the gift that is upon it, is a debtor. 23 Woe to you scribes and Pharisees, hypocrites; because you tithe mint, and anise, and cummin, and have left the weightier things of the law; judgment, and mercy, and faith. These things you ought to have done, and not to leave those undone. 24 Blind guides, who strain out a gnat, and swallow a camel. 25 Woe to you scribes and Pharisees, hypocrites; because you make clean the outside of the cup and of the dish, but within you are full of rapine and uncleanness. 26 Thou blind Pharisee, first make clean the inside of the cup and of the dish, that the outside may become clean. 27 Woe to you scribes and Pharisees, hypocrites; because you are like to whited sepulchres, which outwardly appear to men beautiful, but within are full of dead men's bones, and of all filthiness. 28 So you also outwardly indeed appear to men just; but inwardly you are full of hypocrisy and iniquity. 30 And say: If we had been in the days of our Fathers, we would not have been partakers with them in the blood of the prophets. 31 Wherefore you are witnesses against yourselves, that you are the sons of them that killed the prophets. 35 That upon you may come all the just blood that hath been shed upon the earth, from the blood of Abel the just, even unto the blood of Zacharias the son of Barachias, whom you killed between the temple and the altar. 36 Amen I say to you, all these things shall come upon this generation. 38 Behold, you house shall be left to you, desolate. 39 For I say to you, you shall not see me henceforth till you say: Blessed is he that cometh in the name of the Lord. Read the perfection series and the Doctors of the Church series. All positive steps to avoid hypocrisy. See my posts on charismatics. Youth ministries which are heretical are too many too mention. No disrespect intended, but I think you're portraying charismatics in a bad light (I'm not one, just so you know). All of the charismatics I've known love the Church and desire to learn theology and (good) philosophy. Against the Charismatics Again: Garrigou-Lagrange on Revelations. Posted by Supertradmum. I should have read this last year to strengthen my many articles against false seers, but many of his points I came to as well. So many Catholics, especially charismatics, think suffering is to be avoided. I have never heard a charismatic say that suffering is a good and may be an indication of the Dark Night or purgation of the senses and spirit.